Posted on September 21, 2012	by Katy K.
I was very excited to win this from Charlotte’s Library several months ago. Anyone who, like me, read Graceling and Fire, or who heard about the massive competition for the ARCs of this book knows it was a big splash in the teen fantasy realm this summer. Still, since the book came with a request that I tweet about it and I don’t tweet, so I thought I’d review it. In Cashore’s first book, Graceling, our heroes defeated the sadistic King Leck, whose Grace allowed him to force people to hurt themselves or others and believe that nothing bad was happening. They rescued his ten-year-old daughter, Bitterblue, and set her on the throne with a team of advisors. 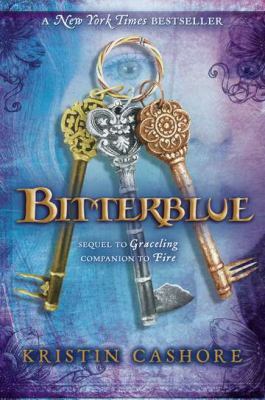 Now Bitterblue is 18 and trying to repair the damage her father did to the kingdom. We’re talking kidnapping girls from every village in the kingdom just as a start, so this is no small matter. Her advisors are for the most part men who served her father, as well. They have decided that what the kingdom needs is forwardthinkingness, so that nothing from Leck’s reign will be discussed or brought up for trial. All crimes committed during the reign are forgiven, because Leck could have forced any crime. But Bitterblue feels that she needs to know what her father did and what’s going on with the kingdom now if she is to do her job. She starts sneaking out at night, finding the hidden pubs where people tell stories, often obliquely related to what happened during Leck’s reign. The very first night she is out, she befriends two young trouble-makers, Saf and Teddy, giving her name as Sparks to protect her anonymity. Thus her trying to find out the truth starts out with lies, which always complicate matters. Katsa and Po make brief visits from time to time, but they are busy trying to topple evil kings in other nearby kingdoms, and so cannot stay. The more Bitterblue learns, the more she realizes that the problems in the kingdom are deep. They did not die along with Leck, and she must find out who among her advisors she can trust and who is perpetuating the problems. Bitterblue journeys through darkness trying to understand her father, comparing remembering and forgetting as paths to healing. There’s a lot of dealing with ciphers, as Bitterblue’s mother taught her the theories of ciphers in secret, and both her parents used ciphers to keep their secrets. And while Bitterblue’s darkness is dark indeed, there’s still light to balance it, from the beauty of art and the joy of friendship, with a bit of early romance. It was very satisfying to see Bitterblue find her way towards a more open justice. It’s not for reading when one needs unicorns and rainbows (one does, sometimes), but it is a hopeful treatment of a dark subject with a most courageous protagonist. A note: my teen librarian said she’d been hearing rumors of racism about this book. I read and read looking out for it, until finally at the very end, I found the passage that I think must have bothered people: a woman with dark skin is described as a monster. She is in fact Fire, the heroine of the book of the same name, and she is a monster not because of her skin color but because she has “unimaginable beauty and the ability to control minds”, as do other people and animals of various skin colors on the other side of the mountain. As usual, reading in context is helpful and highly recommended. This entry was posted in Books, Uncategorized and tagged teen fantasy. Bookmark the permalink.